“It's made in England and we use it as preventative maintenance and also to treat soft tissue that may have become stressed or inflamed,” said Cerin, who has treated horses nationwide as a highly sought-after Equine Massage Therapist. “With each horse, we school them first in order to get them comfortable, because they're going to be standing in a confined space when treated. “It takes five minutes to get the water up over their knees and above their hocks,” said Cerin. “The water temperature is very consistent, at about 35 to 36 degrees, so we don't want the level to get any higher, because if their belly was submerged, it's pretty cold for them just to be standing there. 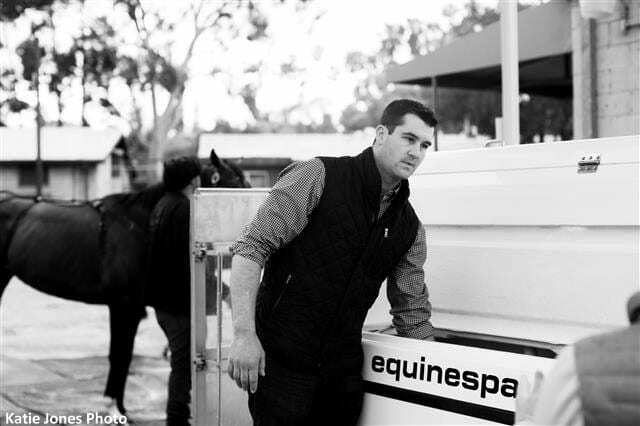 This entry was posted in Horse Care, NL List and tagged equine massage, equine spa, equine therapy, Horse Racing, salt water, santa anita, santa anita park, therapy, tyler cerin, vladimir cerin, Zoe Cadman by Mike Willman/Santa Anita. Bookmark the permalink.